﻿May Day: Calendar, History, Tweets, Facts, Quotes & Activities. May Day marks the halfway point between the first day of spring and the summer solstice. May Day dates back to the days of the Romans and involved many pagan rituals and ancient customs which were slowly phased out with the arrival of Christianity. Festivals, dances, and rituals related to agriculture and fertility were practiced by many Germanic and European countries. 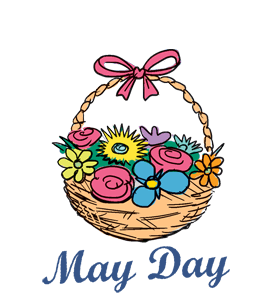 May Day also commemorates the struggle for fair labor practices and the Haymarket Affair of 1886. It is observed on May 1st each year. Roman Catholics celebrate May as Mary's month, and May Day is celebration of the Blessed Virgin Mary. May Day is also recognized as International Worker's Day, or Labour Day. This day commemorates workers rights and the labour movement. One popular cause that this day commemorates is the eight-hour workday. During the Haymarket Affair of 1886, more than a dozen people were killed after a 3-day strike and rally. US Labor Unions had agreed upon a general nationwide strike on May 1, 1886 in support of an eight-hour work day. One such rally, held outside the McCormick Harvesting Machine Company, Chicago, Illinois, became violent when police fired into the crowd of striking workers. Outraged, the worker's organized another rally the next day at Haymarket Square. The rally became violent when a bomb was thrown into a crowd of police. Seven officers were killed. A very public trial ensued which ended in the public hanging of four anarchists. In France, it is customary to give a sweet smelling flower called the spring of lily of the valley (a symbol of springtime) on May 1st. The tradition started in 1561 when King Charles IX of France received a lily of the valley as a lucky charm. All labor that uplifts humanity has dignity and importance and should be undertaken with painstaking excellence. – Martin Luther King Jr.
Dance around a Maypole. Decorate a tall pole with garlands of flowers and ribbons. Have a group of friends each take a ribbon and dance around the pole, interweaving the ribbons to form a braided affect. The braid can be undone by retracing one's steps. Have a picnic outdoors in the sunshine. Attend a May Day Festival. Visit a local fresh air market.